Amber Mac(Arthur) started her career in San Francisco and Boston during the dot-com boom in the late 1990s. As a strategist for Razorfish and Director of Marketing for an e-procurement software company, she spent four years in the technology start-up trenches. Amber left the start-up world to join Microsoft to build one of the first female-focused lifestyle portals. In 2007, she started her own digital marketing agency. The company’s first client was world-renowned business coach Tony Robbins. Their client list also includes Microsoft, Intel, Shopify, Ford, Canada Goose, Fast Company, PayPal, Scotiabank, Yellow Pages, and many more leading organizations. In 2010, she wrote the national bestselling business book Power Friending (Portfolio: New York). In 2016, she co-wrote an Internet safety book called Outsmarting Your Kids Online (with security expert Michael Bazzell). Amber has keynoted more than 300 events around the world. Topics include business innovation, Internet of things, online safety, artificial intelligence, the distraction economy, and what it takes for companies to adapt and grow. 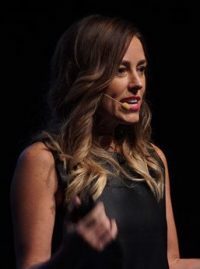 She is a regular business host and expert for Fast Company, Shopify, CNN, Bloomberg TV, CBS, BNN, The Marilyn Denis Show, and SiriusXM Radio and has more than two million social media followers online.